The list of things an infant is proficient at may be quite small, but one thing definitely on the list would be holding on. Have you ever noticed how even a newborn will grasp your finger if placed in his hand? At this age, holding on is a reflex; it's the letting go that needs to be learned. It seems that learning to let go is a lifelong process. Regardless of the stage of life we're in, we're in the position of letting go of someone or something, whether it be letting go of that toy that seems soooo much better than the one we have (or car, or house, or job, or...) or letting go of our children as they go off to pre-school (or get their driver's license, or go to college, or move out, or marry, or...). The list goes on and on. I don't know about you, but I'm not a big fan of change. I like routine, and order. I like to know what to expect. The hard (at least for me) truth is, change is a part of life and we often have little control over our circumstances. So how do we navigate through the times of transition? 1. Recognize that change is an inevitable fact of life. Why is it I'm surprised when something comes to an end? Life is fluid - children grow up, people move, jobs change, relationships end. Change can be healthy and is definitely not unusual. 2. Believe that "different" may in fact be "better"! What we focus on gets bigger. Those words have made a tremendous difference in my life. If I look for things I don't like, I will succeed in finding them. But regardless of the circumstances, if I look for the positive that is what I will find. 3. Choose to embrace the season of life you're in. When I spend my time and energy trying to cling to what is past, I'm actually fighting what God is doing in my life. God gives his children good gifts and works everything out for our good, even if appearances say otherwise. It's important to trust God and remember that He always has our best interests in mind. Lord, give me eyes to see You in every circumstance. Help me to focus my attention and energy on what You are doing right now rather than groping for the past or rushing for the future. 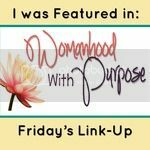 Linking up with: "Womanhood with Purpose", "Spiritual Sunday", "Tell Me a Story", "Soli Deo Gloria"
Thank you Lisa...Sometimes I say "Keep the change" and other times I look at it in my palm and slip it into my pocket. Have a great weekend! Lisa, other members of the Christian Poets & Writers Group would surely benefit from your biblically wise words :) I'd be glad to repost this on http://christianpoetsandwriters.blogspot.com but don't see that option on your page. 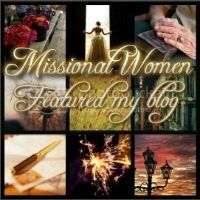 You're listed on the Blogroll, of course, but if you add a "B" button for "Blog It!" let me know, and I will. God bless. Being where and when the Lord wants me/calls me to be is all that truly counts. AND, re: the newborn baby finger holding... I mentioned it in my post, b/c I'm always just overwhelmingly filled with joy when my finger is held. Might not be a wonderful reason according to reality, but I like it as a treat. Blessings. Good thinking/sharing as usual. Thank you for sharing at Tell me a Story. Letting go is difficult at times. Letting our children go out on their own, when a few days ago (it seems) we had the say on what they did or where they went. Letting go of anxiety is a good one. I must let go of things that cause me stress, yet I must also do a certain amount even of that at times. May you be blessed in your holding on and letting go!